In May-June 1993, with the grace of Poojya Gurudev, Swami Chinmayanandaji, I was inspired to write certain spiritual texts in Sanskrit. Poojya Gurudev blessed the same before attaining Mahasamdhi. 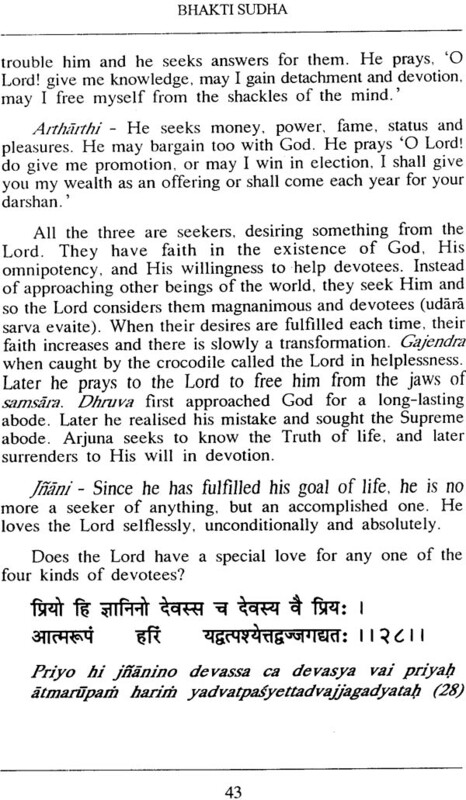 These texts are Manahshodhanam, Jnanasaar, Dhyanasvarupam and Bhakti-sudha. 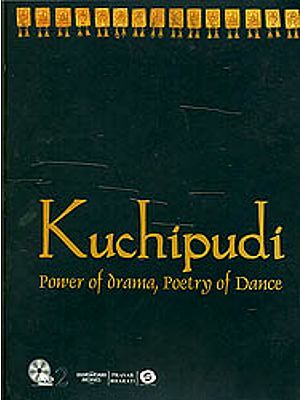 They are all put in a book titled ' Sadhanasopana' - the steps of spiritual practice. Man initially needs to purify his mind (Manahshodhanam). A mind free from likes and dislikes alone is capable of grasping the essence of Self knowledge (Jnanasaara). Knowledge takes deep root by practice of meditation (Dhyanaswarupam). The spiritual practice culminates in the gain of the nectar of devotion (Bhaktisuddha). The last is commented upon in the following pages. The ideas written in the texts are not original. They were written for the purpose of self reflection. 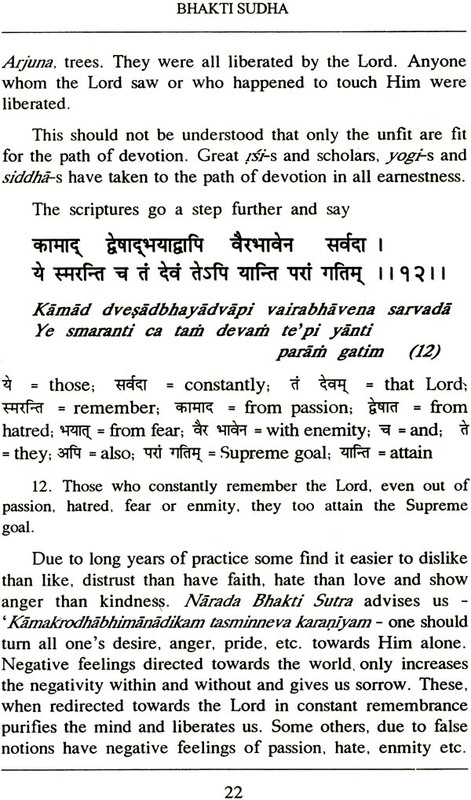 You will find in them the essence of various scriptures on devotion (Bhakti Shastras) like the Ramayana, Bhagawata, Narada Bhakti Sutra, Geeta, etc. I pay that the text and commentary will help all who read and study it to gain true devotion for the lotus feet of the Guru and Lord. Devotion for Sri Rama is the rainy season and the devotees are the crops. The two letters ra and ma are the two main months - Sravana and Bhadrapad of the rainy season. In summer, the land is parched and barren. All beings are tortured by the heat and crave for rains. In case of a drought, the situation worsens and there is poverty, hunger and death. With the first signs of rain, there arises hope in all, for the good days to come. With the first showers, all rejoice and the earth gives its sweetest fragrance. In India, we have a four months monsoon season. In the months of Sravana and Bhadrapad (months of the Indian calendar which fall around July and August), the rains intensify. The deepest layers of the earth get soaked with water, the rivers flow with full strength and speed, the lakes and ponds are full to capacity. All beings feel happy and satisfied. Mother earth wears her rich, green clothes and is bedecked with beautiful flowers, valuable herbs and trees and nourishing fruits and crops. The farmers are content, business prospers and there is an overall feeling of confidence and happiness in the country. Similarly, when a man's heart is dry and parched, with the rubble and stones of bitterness, anger, jealousy, cynicism, dislikes and hatred, he remains miserable and makes others unhappy too. With even a trickle of love, there is a sense of relief. A shower of love brings total fulfilment. Such devotion is gained by the grace of the Lord and influence of satsanga (company of the great) and chanting the divine name of Lord Rama. Such a crop of devotees sustain and nourish the entire society. Devotion for God is complete fulfilment in itself and it adds beauty to all our worldly achievements of name and fame, wealth and pleasure etc. However, without this devotion, everything is incomplete and meaningless. It is something like a person wearing ornaments without wearing clothes. This example given in Tulasi Ramayana is powerful and expresses the supreme status of devotion in one's life. There is an interesting story in the Puranas. Devatas" (demi gods) and the 'Asuras' (demons) worked together to churn the milky ocean. After overcoming many obstacles, they got a pot of nectar. None wanted to share it with others. There was a fight over its' distribution. Finally, some got more, some less and the Asuras did not get at all. Even those who got it were not totally satisfied. Those who drank the same, got a temporary victory over others. This nectar did not rid them of fear and anxiety, desires and cravings. This is the case with all worldly achievements. The nectar of devotion is different. It is shared with all and it increases on sharing. There is only joy in another's gain of it and •there is no anxiety or fear of losing it. It gives one immortal fame and lasting happiness.